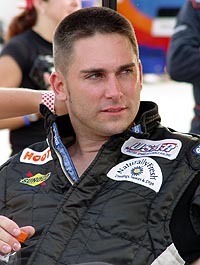 Its been several years since USAR Hooters Pro Cup Series driver Michael Ritch has won a race. In fact, the last time the veteran hit Victory Lane was in 1999 at Caraway Speedway in North Carolina. At Southern National Speedway, it looked like that streak might come to a streaking halt. happened. We had a screw come out of the carburetor and the only way we could have fixed it was to change the carburetor and we didn’t have a spare carburetor. So that is what happened. Of course, Ritch didn’t almost make it to halfway. 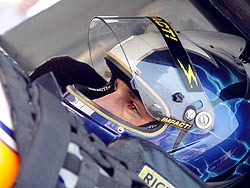 When he was catching early leader Kirk Leone before taking the lead on lap 32, the two drivers made contact that forced Ritch to briefly brush the outside wall and bent in his left front fender. “We had 220 more laps to go,” said Ritch. “I caught him and he came up the track and squeezed me up into the wall. I tried to press the issue a couple of times and he pinched me off into the wall since I was running the high line coming off the corners. The third time was it. Ritch finished a disappointing 29th. Clay Rogers hasn’t won in 2005. But he’s the first to add “yet” to that phrase. And if Rogers has any ideas, there is one place he’d like to win. Ritch led the first lap after starting on the outside pole, then led from lap 32 until lap 125. The following lap, a lap after earning the halfway leader award, Ritch’s car slowed on the frontstretch after a big pop. The car coasted to a stop, and Ritch was never seen on the track again. And Rogers is getting closer. He finished second at Southern National Speedway, his fourth runner-up finish of the year. “That seems to be a characteristic of this team,” said Rogers. “We are a great team and we can win some of these races. But something is just happening to us that is keeping is from that first win of the year. If there is something that Shane Huffman has learned in 2005 is that you just can’t win them all. there before the race and it really came back to haunt us. We aren’t perfect and we all make mistakes. We win as a team and we lose as a team. That is what championships are built of. I never gave up. The team never gave up. How intense are things getting as the Southern Division starts to wrap up its regular season? After the race at Southern National Speedway, Rookie of the Year points leader Chase Pistone was upset that he finished 10th instead of eighth. That is because, as the year begins to wind down, every single point counts. And when the Rookie of the Year title is right there in front of you, there is nothing you want to stand in your way of that goal. 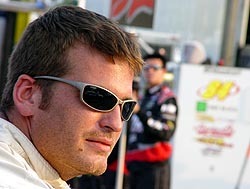 Huffman had won six of the nine Southern Division Series races leading into the event at Southern National Speedway. Make that six out of 10. Huffman finished third at Southern National. “You can’t win them all,” joked Huffman after the event. “We knew that. 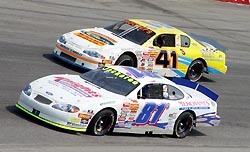 However, Pistone wasn’t fatigued enough to allow the true racer to come to light late in the race when he and fellow rookie Michael Faulk got together on the white flag lap. The contact from Faulk resulted in Pistone slipping from a solid eighth-place finish to a 10th-place run and allowed Faulk to gain a couple of points of Pistone in the rookie point standings. It also dropped Pistone from 10th to 11th in the overall Pro Cup point standings. Despite the contact, Pistone still holds a 40-point lead over Faulk in the Miller Lite Rookie of the Year standings in the Southern Division. Earlier this year, Whelen Modified Tour driver Donny Lia made his Pro Cup Series debut and impressed many, qualifying in the top-three and finishing just outside the top-10 in his first real race in a full-bodied stock car. At Southern National Speedway, another Modified ace, this one from the South, made his Pro Cup debut, but it didn’t go nearly as well. In addition, there have been some Pro Cup flavor in the driver’s seat of the Truck Series. 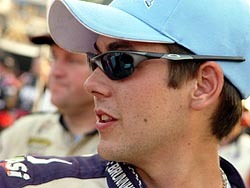 Defending Pro Cup Series champion Clay Rogers has run four races in the Truck Series in 2005. Three have come with Glynn Motorsports and one with his current Pro Cup team, Baird Motorsports. His best finish came at Texas, where he finished eighth. Rogers’ younger brother Brad made his Truck Series debut driving for the same Glynn Motorsports team at Memphis and came home with a 19th place finish. 'It was a really good run for me,” said the younger Rogers of his run. “We stayed on the lead lap all night long and that was one of my goals coming into Memphis. We had a tight truck from the drop of the green flag, but we continued to work on it through out the night. This is a great boost of confidence for me." Now, Clay is again entered for a Truck Series race, at Indianapolis Raceway Park. He will be joined there by fellow Pro Cup Series regular Michael Faulk, who has entered the event with his #53 Pro Cup Series team. When it rains it pours. A monkey is on his back. A black cloud is following him. If it weren’t for bad luck, he’d have no luck at all. Murphy’s law is catching up. L.W. Miller made his first Pro Cup start in the Merchant's Tire & Auto Center 250. Unfortunately, it was very brief. Miller was involved in the lap-nine caution and parked his number 19 on lap 11. The NASCAR Craftsman Truck Series and the Pro Cup Series are starting to form quite a relationship, even if it is just a completely unofficial one. The Truck Series has had a bigtime Pro Cup flavor this year, and it is only likely to get more flavorful as the year progresses. It started last season, when the Pro Cup Series and Truck Series ran their first combined show, coming at Bristol Motor Speedway. The night was a huge success and the two races were both more entertaining than the Cup and Busch races at the track during the same week. This year, the two series will team up at Bristol yet again. No matter what cliché you use to talk about bad luck, it all means the same. And if things keep on going, there is a chance that the name Brunnhoelzl will be a part of a new bad luck cliché pretty soon. Just when it looks like things are going to get better for Pro Cup Series driver George Brunnhoelzl III, something happens to knock him back down a couple of notches. The driver deserves a medal just for being able to get up in the morning and keep his positive attitude each day after the last race. visited Southern National Speedway. Brunnhoelzl qualified ninth and took his #20 ride to the front quick. In fact, at one point during the race, Brunnhoelzl was faster than the leaders and gaining. The team pitted and came back out having to fight from behind after getting blocked into their pits. He was on his way toward the front again when, just like normal, bad luck struck. During a caution, Brunnhoelzl’s #20 coasted to a stop, the victim of dead battery. “The first half of the race, we had a pretty good car,” said Brunnhoelzl. “We were passing cars, coming up through the field. The car was running good and we wanted to make some adjustments on the pit stop. Richard Landreth has been fast at every race he’s competed in this season. At Southern National Speedway, Landreth finally got a finish that was indicative of how he ran. Just like in the many recent weeks, heat played a role at Soutehrn National Speedway. However, unlike at USA International Speedway and Myrtle Beach, it didn’t quite show as much at the end of the race, even though a couple of drivers had to get a little help after exiting their race cars. One of those was Mike Herman. After climbing from the car Herman would succumb to heat exhaustion which was made worse by inhaling carbon monoxide all night. 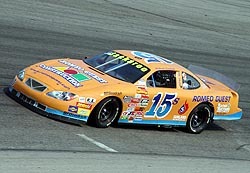 At the beginning of the 2005 season, Jody Lavender said one of the main goals of his team was to improve their consistency. “The way we’ve been running, the finishes don’t really show it,” said Landreth, whose top finish leading up to the race was 12th. “We’ve had some mechanical problems here and there and had some bad luck here and there. Based on the past five races, it appears they have achieved the consistency with five top-10 finishes. And with the recent surge, Lavender has jumped to seventh in the points, only 11 points out of sixth place and only 29 points out of fourth place. Lavender continued his consistency at Southern National Speedway, where he qualified third, took the lead on lap 126 and went on to finish fourth after experiencing late brake problems. caution, the brakes came back, but it was too late. I didn’t have anything left. My tires were gone. After a disappointing run at Hickory Motor Speedway, the MB3 Motorsports Team was determined to turn their racing luck around at Kenly. "It’s a tough track and really hot, just like we expect the racing to be," said Faulk. Faulk qualified 15th position and was ready to make his dash towards the front of the pack. As the race progressed, Faulk was able to run as high as second, but lapped traffic and excessive side-by-side racing made his car loose towards the end of the race and Michael held on for a solid eighth-place finish. The top-10 finish moved Faulk up to 12th in overall points and second in the rookie points race. "That was a lot of fun," said Faulk. "Our car was really hooked up until the end. It was typical short track racing, just the way I like it. "This battle for the Rookie of the Year in the southern series is going to go down to the last race of the year, and we plan on doing what it takes to win it," Faulk said. "Our goal is to finish top 10 in points and win at least one race before the season is over."